*Corresponding author: Dr Mehmet Çınar, Department of Obstetrics and Gynecology, Zekai Tahir Burak Women’s Health Education and Research Hospital, Talatpaşa Boulevard, Hamamönü, Altındağ, 06230, Ankara, Turkey. In this descriptive longitudinal study we aimed to evaluate the predictive role of middle cerebral artery Doppler velocimetry in assessing non-reactive non stress test (NST). 148 cases with recovered non-reactive NST group were classified as group 1 and 151 cases persistent non-reactive NST as group 2. Data collected and age, GW (gestational weeks), gravidity, parity, middle cerebral artery Doppler velocimetry, non stress test (NST) were evaluated of each patients. MCA Doppler PI levels were significantly low in group 2 (p<0.05). The cut-off value of MCA Doppler PI for distinguishing the groups was 1.51 with 89.3% sensitivity, 52.4% specificity, 78.6% and 71.4% for positive and negative predictive values, respectively. Univariate logistic regression method demonstrated that MCA doppler PI<1.51 was a significant risk factor for persistent non-reactive nst with, odds ratios (95% confidence interval) as: 9.167 (2.103–39.958); p=0.001. According to this study, MCA Doppler velocimetry should be a promising marker in predicting fetal well being to evaluate in patients with non-reactive NST. There are several techniques for ante partum fetal surveillance and electronic fetal heart rate monitoring (EFM) has been the cornerstone for fetal assessment. Non Stress test (NST) is one of the ante partum monitoring method that is used to evaluate the fetal wellbeing and to eliminate fetal distress. NST shows two patterns: reactive which is indicative of fetal well being and non-reactive which may be associated with adverse fetal outcomes. Even though NST is sensitive for detecting fetal distress, it has low specifity; there is no evidence of intrauterine distress or acidosis, in as much as 50–80% of fetuses who had non-reactive NST [1,2]. Doppler ultra sonography examination is a non-invasive procedure for predicting fetal well being with using vascular blood flow velocity like umbilical artery, umbilical vein, aorta, middle cerebral artery (MCA). Doppler velocimetry of the middle cerebral artery (MCA) is a method that is detects impedance-resistance to flow in the fetal brain circulation. Vasodilatation of the MCA is investigated to show a compensatory phenomenon called as the “brain sparing effect” . A reduced pulsatility index reflects vasodilatation of the MCA and this have been shown to be early signs of fetal compromise and their presence has been shown to be associated with poor labor outcome [4-7]. The technique of MCA PI measurement is comparatively angle independent. For PSV measurement, the angle between the ultrasound cursor and the direction of the blood flow should be provided as possible as to 0°. The measurements at the proximal portion of the preferred site of middle cerebral artery supply this correct angle of measurement, but measurements at the mid and distal portions of the middle cerebral artery give rise to higher PI values and lower PSV values compared to the proximal part . In this study, we aimed to evaluate the role of MCA Doppler velocimetry in predicting the fetal status and fetal well being in patients with non reactive NST. This descriptive longitudinal study was designed at Dr Zekai Tahir Burak Women’s Health Education and Research Hospital, from January 2015 to July 2015 and was approved by the local ethics committee of the institution. This is a tertiary research and education hospital in middle of Turkey and with approximately 25.000 deliveries per year. Most of the health services are free of charge and supported by the central government of Turkey. The study was performed according to the standards of the Helsinki Declaration. Informed consent was obtained from all participants. A total of two hundred and ninety nine healthy pregnant patients with non-reactive NST whose maternal ages between 22-33 years and carrying pregnancies between 37 and 40 weeks (according to the last menstrual period or first trimester ultrasound) were enrolled to the study. The risk factors evaluated were; age, GW (gestational weeks), gravidity, parity, middle cerebral artery Doppler pulsatility index (MCA Doppler PI), middle cerebral artery Doppler resistance index (MCA Doppler RI), middle cerebral artery doppler systolic/diastolic ratio (MCA doppler S/D), middle cerebral artery doppler peak systolic velocity (MCA doppler PSV), non stress test (NST). Patients with maternal systemic disease or known feto-maternal risk factors (abnormal first or second trimester aneuploidy screening tests, abnormal glucose tolerance test, fetal anomalies, feto-maternal infections, hypertensive states of pregnancy, intrauterine growth restriction, oligohydramnios, placental disorders, and smoking), which may affect the pregnancy outcome, were excluded from the study. Data recorded for each patient were obtained from the patients and hospital database. Fetal movements, tone, and breathing movements (within a 30-min period), amniotic fluid index (AFI), and measurement of deepest vertical amniotic fluid pocket (DVP) were determined by ultrasound. DVP values <2cm and AFI values <5cm were defined as oligohydramnios . All women were referred to the Radiology department for doppler indices of the middle cerebral arteries (MCA) using a Aloka prosound F37 ultrasound machine (Hitachi, Japan) by a 3.5 or 5mhz trans-abdominal convex transducer. The Doppler was set at pulse repetition frequency of 2.4khz, normal quality and low wall motion filter. The angle between the ultrasound beam and the direction of blood flow was always less than 30°. MCA diameter was measured at a distance of 6 mm from the circle of Willis, at the peak systole. The crossbar of the caliper was placed as it converges with the flow (‘in-in’ measurement). All ultrasonic assessments were performed by an experienced single sonographer. Non-stress test was conducted using cardio tocography machine (Philips Avalon FM30 fetal monitors, Philips Healthcare, Amsterdam, Netherlands). Normal (reactive) non-stress test was defined as two or more accelerations that peak at 15bpm or more above baseline, each lasting 15 seconds or more, and all occurring within 20 minutes of beginning the test. Accelerations with or without fetal movements were accepted, and a 40-minute or longer tracing to account for fetal sleep cycles were performed before concluding that there was insufficient fetal reactivity. Patients with non-reactive NST tracings without decelerations were considered eligible for the study. If the NST was non-reactive and the patient accepted to participate, MCA Doppler measurement was taken and PI, PSV was noted. We used vibroacoustic stimulations to get reactive NST . NST was repeated and patients were divided two groups according to their second NST results. Patients whose second NST were activated defined group 1 and persistent nonreactive defined group 2. Groups were compared in terms of their MCA Doppler results. Mean and standard deviation (SD) were calculated for continuous variables. The normality of the variables was analyzed by Kolmogorov–Smirnov test. Independent Sample t test and Mann Whitney U test have evaluated associations between the categorical and continuous variables. The receiver operator characteristic (ROC) curve analysis was used to evaluate the predictive role of MCA Doppler. Logistic Regression Analysis was performed to find the risk variables for maternal and perinatal outcomes by including all related variables to the model. Odds ratios were calculated by logistic regression method. All variables were included in the backward stepwise procedure. Two-sided p values were considered statistically significant at p<0.05. Statistical analyses were carried out by using the statistical packages for SPSS 15.0 for Windows (SPSS Inc., Chicago, IL, USA). Table 1 depicted the demographic and clinical characteristics of the patients. The mean age of the patients in group1 was 27.46±2.74 years and in group 2 27.85±3.15 years (p=0.644). 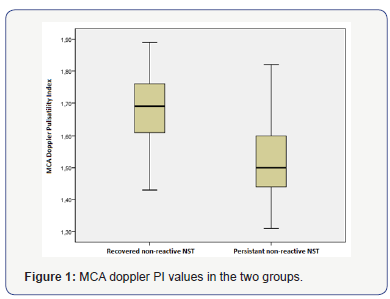 MCA Doppler PI levels was statistically significantly lower in persistent non-reactive NST group (group 2) (1.67±0.11 vs 1.54±0.14; p=0.001). There were no statistically significant differences between groups in terms of gravidity, parity, gestational weeks, MCA doppler RI, MCA doppler S/D and MCA doppler PSV levels (p>0.05) (Figure 1). GW: gestational week; MCA: Middle cerebral artery; PI: pulsatile index; PSV: peak systolic velocity; RI: resistance index; S/D: systolic/diastolic ratio; p<0.05 is statistically significant. According to the ROC curve analysis (Figure 2) MCA Doppler PI levels was found to be a discriminative parameter in patients. The area under curve (AUC), cut off values, sensitivity and specificity are shown in (Table 2). The best MCA Doppler PI cut-off value for distinguishing the groups was 1.51 with 89.3% sensitivity, 52.4% specificity, 78.6% and 71.4% for positive and negative predictive values, respectively. MCA: Middle cerebral artery; p<0.05 is statistically significant. Univariate logistic regression method demonstrated that MCA doppler PI<1.51 was a significant risk factor for persistent nonreactive NST with, odds ratios (95% confidence interval) as: 9.167 (2.103–39.958) (p=0.001). 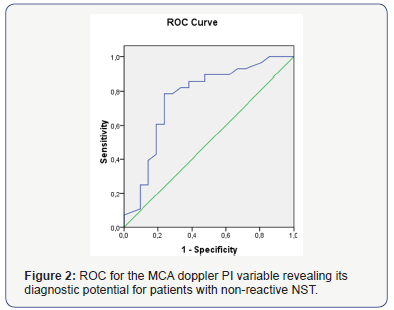 In this descriptive longitudinal study we evaluated MCA Doppler in patients with non-reactive NST and divided patients into two groups with non-reactive NST that subsequently recovered to reactive NST and persistent non-reactive NST. To the best of our knowledge this is the first study evaluating the MCA Doppler is a predictive factor of persistent non-reactive NST. For this, we assign the pregnant patients ages, gravidity, parity, gestational weeks and also fetus MCA Doppler and electronic fetal heart rate pattern (NST). We found that a lower MCA Doppler PI level has a predictive value for the patients with persistent nonreactive NST. According to the ROC curve analysis MCA Doppler PI levels was 1.51 (89.3-52.4) for detecting persistent non-reactive NST. In linear regression analysis, we found that lower MCA Doppler PI levels mostly attributable to persistent non-reactive NST (β coefficient: 0.786, p=0.001). The primary goal of antenatal evaluation is to identify fetuses at risk for intrauterine injury and death so that intervention and timely delivery can prevent progression to stillbirth. Ideally, antenatal tests would decrease fetal death without putting large numbers of healthy fetuses at risk for premature delivery and the associated morbidity and mortality. Although several techniques are used to monitor fetal well-being in both low and high risk pregnancies such as NST, biophysical profile, etc., the most suitable time to apply these techniques and their diagnostic value to detect fetal complications is controversial . Non stress test is one of the available non invasive screening techniques suggested for detecting fetal well being during the prenatal period via using the relationship between fetal movement and heart rate. However, in the third trimester, normal fetuses spend 25% of their time in a quiet sleep state. During the normal sleep state the fetal heart rate variability is reduced, and there may be infrequent breathing movements . Tests performed while a fetus is in a resting state may be incorrectly classified as an abnormal test. Therefore, when using tests to evaluate fetal condition, clinicians need to appreciate whether a fetus is simply in a temporary quiet sleep state or neurologically compromised. Thus, we demonstrated in our study that MCA Doppler PI levels may be a predictor factor to find out the fetus with neurologically compromised. In a present study Raouf et al. found in their study that patients with nonreactive NST results had more fetal complications than those with reactive NST results, moreover they found a statistically significant difference between the groups in terms of the Apgar scores and cesarean ratios. We found in our study that all of patients with non-reactive NST did not have corrupted MCA Doppler velocity. Using MCA Doppler in patients with non-reactive NST may be a reduction in the cesarean ratios. Knowledge of Doppler flow velocimetry of the fetal MCA may assist in perinatal diagnosis and management of complicated pregnancies. A low index of pulsatility in the middle cerebral artery associated with fetal compromise has been described. In fetal hypoxia to protecting brain tissues a vasodilatation occur in the middle cerebral arteries [14,15]. Using the MCA pulsatility index to assess fetal well being make a decrease the likelihood of admission to the newborn intensive care unit and neonatal complications in pregnant [3,16]. Recently, a meta-analysis of 35 eligible studies including 4025 fetuses was performed. It is worth noting that even within the included studies the definition of SGA varied, the timing of MCA recordings in relation to outcomes differed, and the definition of abnormal MCA also varied, though most used PI<2 SD or PI<5th centile . In our study we demonstrated that PI values under 1.51 was associated with poor fetal well-being in patients with non-reactive NST. So we must make a second stage diagnostic test in these patients. The use of the MCA Doppler PSV for the diagnosis of fetal anemia is considered one of the few practice-changing discoveries in fetal medicine. One of the most important contributions of the MCA Doppler PSV to clinical practice has been the dramatic reduction in the number of invasive procedures performed in the management of red cell allo immunized pregnancies [18,19]. In our study we found no statically significant difference in our study groups in terms of MCA Doppler PSV levels. This suggested that there was no anemic fetus in our study population. An abnormal non stress test has approximately 50% false positive rate. 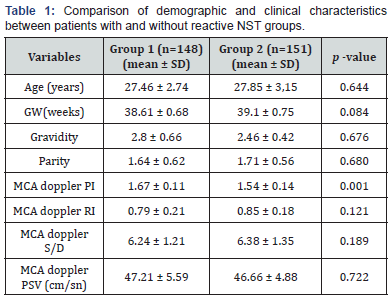 One strength of our study; we were use all of the parameter of MCA Doppler velocimetry to predict the second NST results in patients with non-reactive NST. Generally, only the one parameters of Doppler velocimetry were used and PI levels most studied to evaluate fetal well being, PSV levels most studied to evaluate fetal anemia. The limitation of this study is small sample size. However, this sample size was sufficient to show statistically significant differences in MCA Doppler velocimetry parameters between the groups. 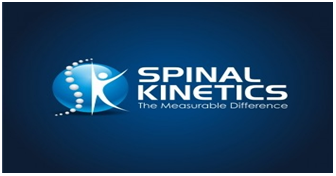 In addition, no other sono graphic factors such as umbilical artery Doppler velocimetry, biophysic profile, etc. was performed to evaluate fetal well being before delivery. In conclusion, we think that MCA Doppler velocimetry should be a promising marker predicting fetal well being in patients with non-reactive nst. Further randomized controlled studies with more participants are needed to evaluate the accurate effects of MCA Doppler velocimetry on patients with non-reactive NST. Black RS, Campbell S (1997) Cardio tocography versus Doppler. Ultrasound Obstet Gynecol 9(3): 148-151. Ozkaya E (2012) Does diurnal rhythm have an impact on fetal biophysical profile? J Matern Fetal Neonatal Med 25(4): 335-338. Khalil AA (2015) Is fetal cerebro placental ratio an independent predictor of intra partum fetal compromise and neonatal unit admission? Am J Obstet Gynecol 213(1): 54 e1-10. Devine P A (1994) Middle cerebral to umbilical artery Doppler ratio in post-date pregnancies. Obstet Gynecol 84(5): 856-860. Anteby EY (1994) Post-term pregnancies with normal cardio tocographs and amniotic fluid columns: the role of Doppler evaluation in predicting perinatal outcome. Eur J Obstet Gynecol Reprod Biol 54(2): 93-98. Vyas S (1990) Middle cerebral artery flow velocity waveforms in fetal hypoxaemia. Br J Obstet Gynaecol 97(9): 797-803. Severi FM (2002) Uterine and fetal cerebral Doppler predict the outcome of third-trimester small-for-gestational age fetuses with normal umbilical artery Doppler. Ultrasound Obstet Gynecol 19(3): 225-228. Patterson TM (2010) Middle cerebral artery median peak systolic velocity validation: effect of measurement technique. Am J Perinatol 27(8): 625-630. Rutherford SE (1987) The four-quadrant assessment of amniotic fluid volume: an adjunct to antepartum fetal heart rate testing. Obstet Gynecol 70(3): 353-356. Haws RA (2009) Reducing stillbirths: screening and monitoring during pregnancy and labour. BMC Pregnancy Childbirth 9(1): 5. Raouf S (2015) Diagnostic value of non stress test in latent phase of labor and maternal and fetal outcomes. Glob J Health Sci 7(2): 177-182. Madazli R, Uludag S, Ocak V (2001) Doppler assessment of umbilical artery, thoracic aorta and middle cerebral artery in the management of pregnancies with growth restriction. Acta Obstet Gynecol Scand 80(8): 702-707. Seyam YS, Al-Mahmeid MS, Al-Tamimi HK (2002) Umbilical artery Doppler flow velocimetry in intrauterine growth restriction and its relation to perinatal outcome. Int J Gynaecol Obstet 77(2): 131-137. Morris RK (2012) Systematic review and meta-analysis of middle cerebral artery Doppler to predict perinatal wellbeing. Eur J Obstet Gynecol Reprod Biol 165(2): 141-155. Divakaran TG (2001) Noninvasive techniques to detect fetal anemia due to red blood cell alloimmunization: a systematic review. Obstet Gynecol 98(3): 509-517. Grubbs BH (2013) Middle cerebral artery Doppler and hemoglobin changes immediately following fetal transfusion. J Matern Fetal Neonatal Med 26(2): 155-157.